Which Texture/Tape is Best for Your Anti-Slip Tape Application? Standard Abrasive Anti-Slip Tape – Ideal for general environments without mud. Little damage to bare skin in case of a fall. Grit size approximately 60, or 0.010” average particle. Available in many standard colors. Coarse Abrasive Anti-Slip Tape – Anti-slip tape good for many industrial environments but can be harsh to skin, so don’t use it where children or disabled and/or elderly adults are likely to fall for reasons other than a slip. Grit size approximately 36, or about 0.019” average particle. Available in black and yellow (unless custom ordered). Extra-Coarse Abrasive Anti-Slip Tape – Best choice where mud may be present. Very, very durable because of its large grit size. Also, useful where extra strong traction is needed, such as external ramps, sloping driveways, loading docks. Aggressive to bare skin in a fall, though. Grit size approximately 24, or 0.027” average particle. Available in black only unless custom ordered. 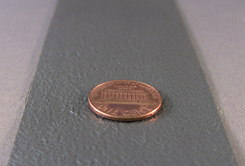 Use Edge Fix to seal the edges for all Safety-Grip anti-slip tape that is frequently exposed to water. 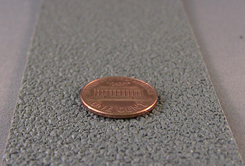 Grit size is less important than slip resistance, as measured by wet Pendulum Test Value (PTV), plus durability. Too heavy a coating on top of any abrasive destroys its effectiveness by drowning the sharp points that provide wet traction. Our technology and quality control, together with use of tough aluminum oxide particles (much more durable than silica sand) result in high slip resistance as well as excellent durability in our anti-slip tapes. These tapes are perfect for areas where the tapes will be submerged in water such as pool steps and bathtubs. Our Standard Aqua-Safe non-abrasive anti-slip tape is perfect for barefoot areas and food preparation areas as it is kinder to bare feet than our Safety Grip abrasive anti-slip tape and is easier to clean. The slip resistance of Aqua-Safe is very good, but Coarse non-abrasive anti-slip grip tape has phenomenal wet slip resistance! It’s perfect for boats, senior living bathtubs, pool decks, and other areas where an extra grippy surface is required. Coarse Resilient will be slightly harder to get perfectly clean than Aqua-Safe, but it’s grip is amazing. On stairs, we recommend that unless state or local regulations require otherwise, you have a a 2″ wide anti-slip tape contrasting color strip no more than one inch from the nose of each stair tread. When considering the cost of non-skid tape, consider also the cost of a slip and fall accident. Hip fractures usually require a minimum of a two-week hospital stay plus surgical costs exceeding $65,000. Additional damages from falls may include income replacement or death benefit; pain and suffering, and loss of consort by family members; economic losses such as failure to complete contracts, close real estate deals, etc. ; decreased quality of life (especially for the elderly); loss of anticipation of future activities, pleasure or comfort (“loss of hope”); and punitive damages. SCOF = Static Coefficient of Friction determined using American Society for Testing and Materials (ASTM) Method C1028-07. Usual safety criterion for level floors is 0.60 or higher. PTV = Pendulum Test Value according to Cermaic Tile Institute of America (CTIOA) test. Usual safety criterion for level floors = 36 and higher. B101.3 = ANSI slip resistance standard test method for dynamic coefficient of friction (DCOF) published in 2012 using the BOT-3000 tribometer and an SBR rubber slider (which simulates shoe bottoms). Usual safety criterion for level floors = 0.43 and higher. For testing Aqua-Safe tapes, we used a TRL rubber test slider which simulates bare feet.